I mentioned last month that I was going to start making my own clothes. Most weekends (and some evenings) since then, I have been doing just that. It has been enormous fun, occasionally frustrating, and very rewarding. Here’s what I’ve made — and what I’ve learned — so far. This is pretty long, so if you like, you can skip down to The start, which is naturally at the bottom. I chose to make the Hollyburn skirt first, because it looked relatively simple, and because I really needed a skirt. Sewaholic Patterns was one of the first independent pattern companies I ran across, and I was immediately drawn to the patterns because they are specifically drafted for pear-shaped women. In ready to wear clothing (and indeed pattern sizes from other companies), my body spans two or sometimes three different dress sizes from top to bottom, so finding a range of patterns in which I fall neatly into one size was a bit of a revelation. Of course, with patterns, it doesn’t matter that much if you do span different sizes, because you can fairly easily grade between sizes when you are cutting the pattern, so that the bodice, waistline and hip sections of a dress fit you properly. But as this was the first garment I made, I wanted to make life easy for myself. I got some cheap fabric (cotton drill) from the Birmingham Rag Market, so that I wouldn’t be wasting much money if I made a complete hash of it. The vast majority of the construction was really easy. I was really proud of the pockets (French seamed!) and the main seams on the skirt are long but straight, so easy to put together. My first hurdle came at the waistband. I had fused the piece of interfacing to the waistband at the beginning as instructed, but found that the waistband was much shorter than the top of the joined skirt pieces, and in fact, not quite long enough to go around my waist. I thought I must have messed up cutting the piece out and accidentally cut out the smaller size. No, problem, I thought, I have plenty of fabric and I’ll cut out another. I checked that I had cut the right size, measured it to make sure that was the right size (it was), then fused it to the interfacing. Then I measured it again: it had shrunk a crucial couple of centimetres. It turns out that the cheap interfacing I was using was really messing up the fabric1. I got some much nicer interfacing, cut another piece, and tried again. This time, it all went perfectly. I was worried about inserting the zip, but even that went fairly smoothly, though I’ll try to get the edges of the seam closer to the zip teeth next time. 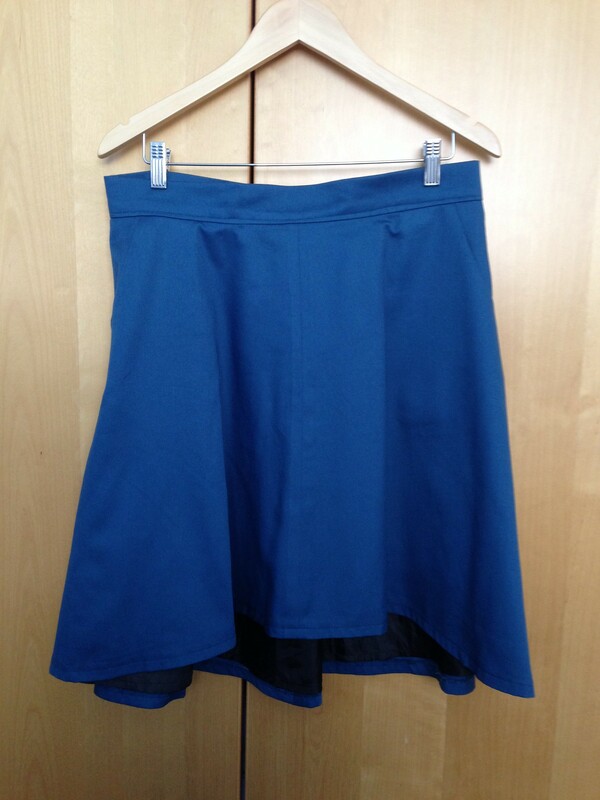 It looks fine for this style of skirt though, and crucially, it lets me get in and out of the skirt! The hemming was a bit fiddly. Being a hobbit, I knew I would have to chop quite a bit of fabric off to get the skirt to fall just on the knee. I enlisted Mr. Bsag to help me measure a constant distance from the floor, so that I could hem it evenly but he found it quite difficult to do with such a full skirt2. Trying to recreate the curved hem of the original while making it slightly longer at the back than the front was even trickier, and I ended up (accidentally) with what would probably be called a ‘high-low’ hem. It actually looks fine on, and is not really noticeable, but since I now know much better how long I need it to be in the front and back, I have already altered the pattern piece directly to make a smoother, more gradual curve. That will also save me cutting out fabric unnecessarily, and make it much easier to sew the hem, since I’ll know that the curve is correct. The finished article fits pretty well. Because of the waistband issue, the waist is a couple of centimetres too wide, so the skirt drops down a bit from my natural waist. It looks fine, and is perfectly comfortable, but next time (with proper interfacing from the start!) I’ll make it precisely to the pattern size, and it will sit snugly at my waist. I also discovered after wearing it with tights that it would benefit from a lining. I got some lining material, cut out the skirt sections and sewed them together (French seaming again), and then hand-stitched the top to the lower edge of the inside waistband, and around the zip opening. That worked very well, considering it was an afterthought, and the skirt wears much better with tights or leggings now. I love this style of skirt: the A-line shape is perfect for me, and the narrow waist emphasises my comparatively narrow middle section. Since I’m so used to wearing trousers, I like the fact that the full skirt allows me to stride about as I’m used to without feeling like I’ve been hobbled. I also love the fact that it has deep pockets for shoving my hands in, or stashing phones and keys. I’ve already got some charcoal grey linen mix fabric to make up another Hollyburn that will be a slightly dressier version. 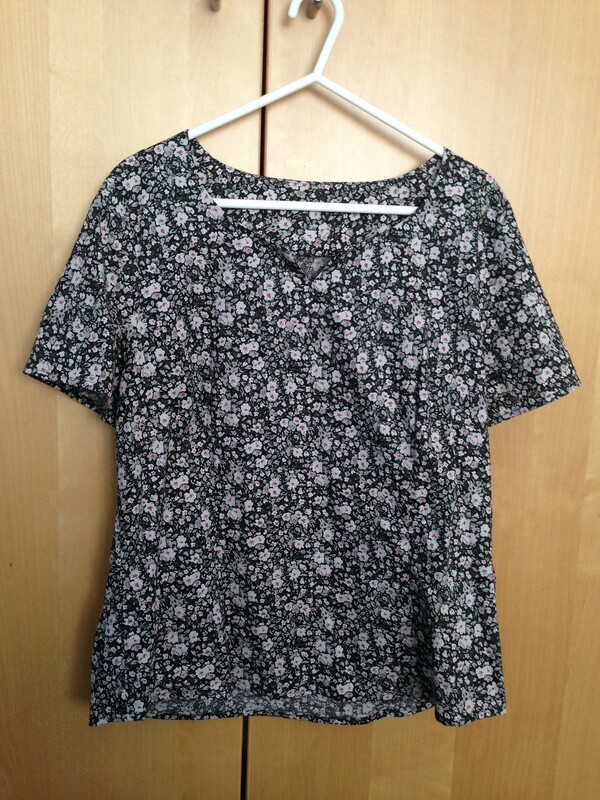 I came across a free pattern for long and short-sleeved t-shirts from French company Deer and Doe, and after checking that you can indeed sew knitted fabrics on an ordinary sewing machine3, I got some cheap jersey from the Rag Market and got stuck in. This was a PDF pattern, so you have to print out the individual sheets, trim them and stick them together to make the pattern. That’s a bit tedious, but you are trading off a cheaper price (free in this case) and instant gratification for a bit of work. I could see from the images of the finished top that the neckline was more plunging than I am comfortable with for everyday wear, so I guestimated how deep I wanted the neckline to be, redrew the curve on the pattern, and shortened the neckband piece proportionally. I had no idea if it was actually going to work, but amazingly it did. I made a long-sleeved and a short-sleeved version, which both turned out really nicely. I made a few minor errors: on the first, I sewed the front and back pieces together at the shoulders with wrong side to right side4, and had to trim the seam off and start again. The short-sleeved version also has the wrong side of the neck-band facing out, but since it isn’t at all noticeable, I just left that as it was. These tops were very quick to make, even with my inexperience and errors, and I have never had a t-shirt that fits so well. I don’t have a photograph as one is in the wash (having been worn to death over the past couple of weeks) and I am wearing the other right now. They are perfectly fitted on the top, the neckline is flattering and feminine without being revealing, and it curves in at the waist before flaring out perfectly over the hips, so you can wear them tucked in or loose. I’m certainly going to make more of these when I get some more cotton jersey fabric. My next project was an Alma blouse, again by Sewaholic. I found some nice floral fabric in black and white with splashes of red, which I knew would go with a lot of my existing clothes. The pattern has several variations for neckline, sleeve length and so on, and they are interchangeable. I wanted a short-sleeved version, but not capped sleeves which look weirdly twee on me, so I used the elbow length sleeve piece and (again) guestimated an appropriate length to cut it off for mid-bicep length. I also did the notched neckline, but didn’t bother with the waist ties. Fictional Passer-by: What are you doing? Me (trying to sound nonchalant and failing): Oh, nothing, just sewing darts. FP-B (shocked but impressed): Shut the front door! I have no idea why my fictional passer-by is so over-effusive, but that’s the inside of my head for you. Anyway, after the Triumph of the Darts, things went somewhat downhill. The notched neckline went well, but the pattern called for an invisible zip to be inserted in the side seam, to help in getting the top on and off. I had an invisible zipper foot for my machine, but had never tried sewing one before. Invisible zippers are the very work of the Devil. They are sort of inside out zips, with the teeth on the inside and the tape on the outside, and they are made to sit (invisibly) right inside a seam. The special foot is supposed to hold the teeth at the correct distance from the needle so that you can stitch very close to them. Both my first and second attempts resulted in stitches being sewn over the teeth themselves somehow, so that the zip wouldn’t close. While I was trying to unpick it all for the second time, the zip came apart. Furious, I pinned up the side seams and gingerly tried the top on. I could get it on and off without dislocating any limbs, so I quickly sewed up the side seams and called it a day. At some point, I am going to have to learn how to fit invisible zips properly, but this was not that point. The second bump in the road came when fitting the sleeves. Fitted sleeve pieces are usually made with a longer edge than the armhole. This is by design, and the instructions tell you to sew a couple of lines of basting and ‘ease’ the sleeve length so that it fits and creates a bit of volume. When the instructions for putting together furniture or other flat-packed items mention ‘easing’ parts together, it usually means that you will need to get a big hammer and bash away until you wrestle the parts together. It turns out that ‘easing’ sleeves is very similar, minus the hammer. The first sleeve went in like a dream: no tucks or wrinkles, and perfectly matched seams. Flushed with success, I sewed the second sleeve in. It all looked great from the top (eased in) side, but when I turned it over, it was like the Ruck, Crease and Pleat Fairies had been to work. It was a complete mess, and no amount of pressing was going to fix it. Gritting my teeth, I ripped the seam out and tried again, sewing very slowly and carefully. Again, the reverse side was a battlefield of rucked fabric. At this point I was close to fetching the big hammer from the tool box, but forced myself to rip the seam again, and this time, sew it with the bodice side uppermost (the reverse of the way you are supposed to do it). I wanted to keep an eye on the disaster zone, and perhaps catch it before calamity occurred for the third time. Somehow, this worked, and the sleeve finally went in without protest. By this point, I was not feeling well-disposed towards this blouse, awesome darts notwithstanding. However, I tried it on, and was amazed that it looked really great. It’s one of those odd garments which looks nothing special on the hanger, but looks great on. It fits well (again, better than any top I have ever bought), and the neckline (which you can’t really see well on the photo) is very crisp and smart. My most recent project (made yesterday) was a pair of Espresso leggings, from a pattern by Cake Patterns. This was another PDF pattern (more cutting and sticking), but it was really fun to make. These leggings are entirely custom fit: you take several measurements of your legs (waist, front and back rise, thigh, knee and ankle circumference, and length from thigh to knee and thigh to ankle), then you fill in circles on the gridded pattern to mark off the relevant points. It’s difficult to describe, but the instructions make it very easy to do. You then join the points up with lines to make a single leg pattern piece, which you then cut out on doubled over stretch fabric. With only two pieces of fabric, this was even faster to make than the Plantain: you just sew the inseams on each leg, then sew the front and back centre seams. All you need to do then is put a piece of waistband elastic in, and enclose it in the fabric, then hem the ankles. I must have messed up the front and back rise measurements, because the waistline, fully extended, was hilariously near my armpits. That was no problem, because I just chopped a big chunk off the top, and then sewed the elastic in. Again, the fit on these legging is amazing. I haven’t bought leggings for years, because they are always either too long, too tight, or the waist sits too low for me. These were amazingly comfortable. The crotch sits very slightly too low, but only by a few centimetres, and it doesn’t cause any discomfort. Since I am intending to wear them under long tunics or skirts, that area won’t be visible anyway. I bought a collection of the Cake PDF patterns, and I’m really looking forward to making more. The way you can custom fit them is brilliant and fun to do. I’m also itching to have a go at the Thurlow trousers (particularly since one pair of jeans has also worn through at the inner thigh5). Like many people, I do a job that is challenging and stimulating, but produces products that are largely intangible. I can work hard all week, but at the end of it, there isn’t anything I can touch or hold and say, “I made this thing”. Sewing fulfils that need for me. You start with a flat bit of fabric and end up (perhaps after a bit of swearing and a few broken zips) with an actual thing that you can wear. It has also started to change my image of my body. As I’ve written about previously, my difficulties in finding clothes to fit, and my indifference to fashion means that I hate shopping for clothes. When I really have to buy new clothes, I inevitably end up with stuff that fits really poorly, does nothing for my body shape, and perpetuates the cycle of me not feeling good about myself. I’ve only just noticed that I have tended in recent years to buy the dullest coloured and patterned clothes I can, subconsciously trying to make myself and my ill-fitting clothes invisible. Since starting to make and wear my own clothes, I have been standing up straighter and wearing brighter colours and patterns. A good friend of mine noticed this and commented that I was “actually quite a funky dresser”. I guess I am, and I’ve only just realised it. I’m beginning to know what I like, what suits me and makes me feel happy and confident, and I’m proud of being able to make those things myself. I just can’t believe that it has taken me 44 years to get to that point. Better late than never, though.